The Virgin Mary appeared in 1946 in Marienfried (Germany), parish of Pfaffenhofen, close to Neu-Ulm, to Bärbel Ruess, aged then 22 years. There were three apparitions: April 25, May 25 and June 25, 1946. We report the essential of Mary’s words translated from German. We put between brackets and in italics our elucidations, comparing Mary’s Message to the one of John’s Revelation. The extract we are reporting is taken from the booklet translated by Nicole Roelli-Senez out of the German original version written by Maria Hepp : “The Message of Marienfried”, printing Paul Geiselmann, Laupheim, 1969 (Germany). “Where the strongest confidence reigns and where it is taught to men that I can do everything, there I will spread peace. Then, when all men will believe in my power, there will be peace. I am the Sign of the Living God. I print my sign on the forehead of my children. The star will pursue my sign, but my sign will prevail over the star”. This place was later named “Marienfried” (fried = peace) because the Holy Virgin Mary had said there: “I give you the peace of Christ”. “I am the Great Mediator of Graces. As the world can find no mercy from the Father unless through the Son’s sacrifice, likewise, you will not be granted besides the Son unless through my intercession. If the Christ is so unknown, it is because I am not known. This is why the Father poured his cup of wrath on the peoples because they rejected his Son. The world has been dedicated to my Immaculate Heart, but the consecration became for many a terrifying responsibility. I ask the world to live this consecration. Have an infinite confidence in my Immaculate Heart! Believe that I can do everything beside the Son. Instead of your hearts full of sins, put my Immaculate Heart, then I will attract God’s strength, and the Father’s love will form again within you the Christ up to perfection. Accomplish my demands so that the Christ can reign soon as the King of Peace. The world must drink the chalice of wrath until the dregs because of the innumerable sins that offended His Heart. The star of the abysses will rise more furious than ever and will make terrifying devastations because it knows its time is short and because it sees that many have already joined my sign. On these, it has no power, even though it kills the bodies of many. But out of these sacrifices made for me comes my power to lead the remaining legion to triumph for the Christ. Some have already accepted to be marked by my sign, and they will always increase in number. To you, my children, I want to say: In the bloodiest days, don’t forget that precisely this cross is a grace, and thank the Father for his Grace, again and again! “I am the Great Mediator of graces. The Father wants the world to acknowledge this position of His Maid. Men must trust that as the Holy Spirit’s permanent Spouse, I am the faithful Mediator of All Graces. My sign arrives. God wants it thus. Only my children recognize him because he is shown to them in secrecy, and for this they give glory to the Eternal. I cannot yet show my power to the world. I must retire with my children. I want to make miracles secretly, in the souls, until the number of sacrifices is complete. It is given to you to shorten the days of darkness. Your prayers and yours sacrifices will annihilate the image of the Beast. Then I will be able to reveal myself to the world for the glory of the Almighty. Embrace my sign so that all soon adore and honor God in Three Persons. Pray and offer through me! Pray continually! Pray the Rosary! Ask the Father for everything through my Immaculate Heart! If what you ask for is for his glory, He will give it to you. Don’t implore for perishable values, but ask for graces for individual souls, for your communities, for the peoples, so that all love and give back glory to the Divine Heart. Consecrate Saturdays to me, as I desired. Offer me lots of sacrifices! Make of your prayers a sacrifice! Be selfless! What matters today is to give glory and atonement to the Eternal. If you dedicate yourselves entirely to this, I will take care of all the rest. I want to load my children with crosses, heavy and deep as the sea, because I love them in my sacrificed Son. I beg you to be ready to carry your crosses, so that soon peace may reign. Embrace my sign so that soon the Holy Trinity be glorified. The Holy Virgin added She had a new message for the world. The circumstances and outer details had not to be reported. “The opinions will divide about this message, a great number will be shocked, but a small legion will understand it well and will spread it. They will recognize my will and will rejoice. This legion has recognized my position in this time and has given me great joy. This legion has its representatives in many countries; they will keep on spreading my message. Many among them have already seen my secret miracles. They recognized that I am the “Admirable Mother” and they glorify me by this title”. Bärbel asked for an obvious sign for men to believe in her message. 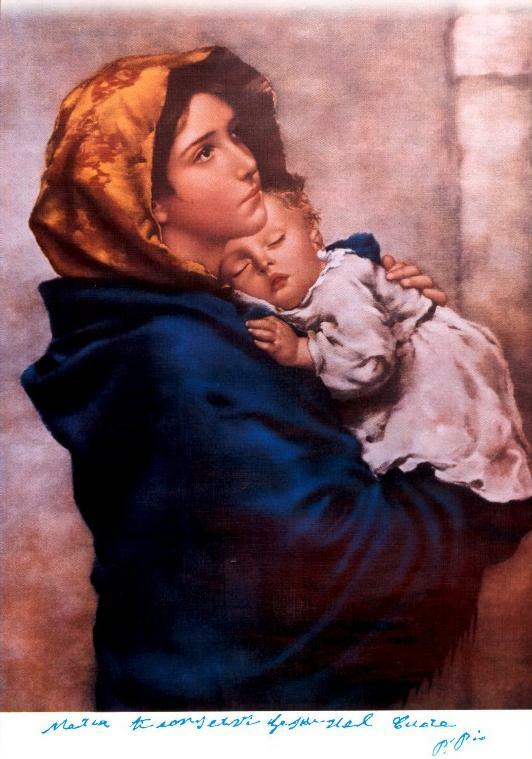 Mary answered that she would not give a sign unless men would have achieved her will. Then She would make miracles greater than ever, miracles within the souls.